Protesters against the closure of the inpatient beds at Rothbury Community Hospital. A new group which will examine proposals for the future of Rothbury Community Hospital will meet in public next week. The 12-bed inpatient ward at Rothbury Community Hospital was closed – temporarily at first, it was claimed – in September 2016 due to low usage, sparking a community campaign to oppose its loss. The services at the hospital are commissioned by NHS Northumberland Clinical Commissioning Group (CCG) and provided by Northumbria Healthcare NHS Foundation Trust. Twelve months on, the board of the CCG voted unanimously to close the ward permanently and reshape the existing services around a health and wellbeing centre at the hospital. But in October last year, Northumberland County Council’s health and wellbeing committee decided to refer the decision to the then Health Secretary Jeremy Hunt. In May this year, the matter was referred by Mr Hunt to the Independent Reconfiguration Panel (IRP), a non-departmental public health body, which issued its response last month. The current Health Secretary, Matt Hancock, asked for an update on progress by the end of January 2019. The council has already pledged to work closely with all the relevant organisations to develop proposals for the hospital over the coming months and Coun Jeff Watson, who also leads the health and wellbeing committee, will chair the new review group. At the first scoping session, it was agreed that the CCG, Trust and OSC would fully engage with the community as the health and wellbeing centre is developed. Coun Watson said: “As timescales are tight it is important, we set up a small working group to ensure progress is made quickly. Although an update is required by the Secretary of State by the end of January, we do recognise work will continue beyond then which the committee will need to monitor and review." 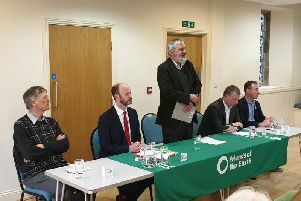 David Thompson, chairman of Healthwatch Northumberland, added: "We welcome the opportunity to continue our involvement in this crucially important issue for people in the Rothbury area, in our role as independent health and social-care champion. We would encourage people to get in touch with Healthwatch with their ideas and views." A meeting of the review group, which the public can attend, will be held in the council chamber at County Hall in Morpeth on Monday (December 10) at 9.30am. However, despite pledges to fully engage with the community, Rothbury's county councillor, Steven Bridgett, has expressed his disappointment that neither he nor anyone from the Save Rothbury Community Hospital campaign group has been asked to be on the review group. He also questioned why the meeting was not being held in Rothbury. "I'd like to say I'm surprised as I had hoped that the council's input would help bring some democratic accountability - that has been sadly lacking on the part of the healthcare trust and the CCG - but sadly this does not appear to be the case. I don't know why I would have thought any differently."